Cadre continues to lead the industry with its Cadence fulfillment and warehouse logistics software system for 3rd party service providers and direct fulfillment companies. We are extremely honored to be recognized by Inbound Logistics as one of the top companies in our industry. 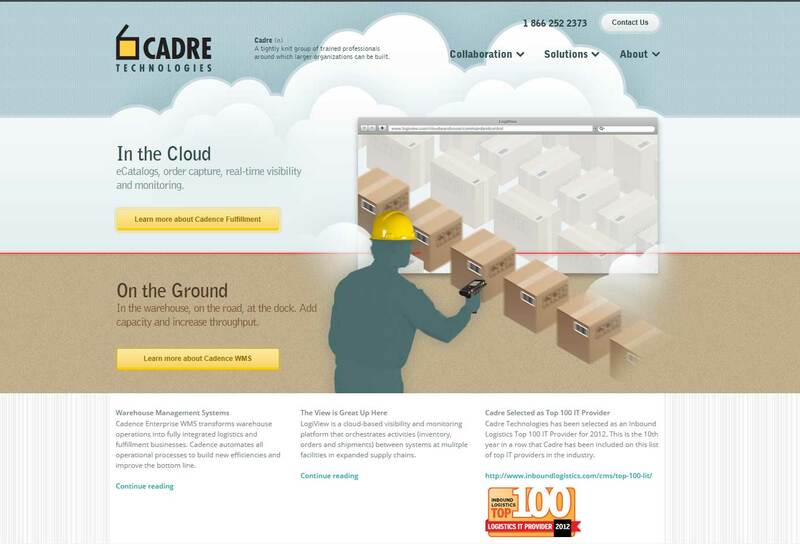 Cadre Technologies has been selected as an Inbound Logistics Top 100 IT Provider for 2012. Every April, Inbound Logistics editor recognizes 100 logistics technology companies that enable logistics and supply chain management excellence. This is the 10th year in a row that Cadre has been included on this list of top IT providers in the logistics industry. “We are extremely honored to be recognized by Inbound Logistics as one of the top companies in our industry. Cadre is proud of the progress we made in the 11 years of business, building a solid fulfillment and logistics platform for our growing customer base of service providers and fulfillment companies,” said Cadre’s CEO, Joe Peters. Cadre provides supply chain management systems and software solutions for 3rd party fulfillment and logistics companies, retail and wholesale distributors, and direct fulfillment companies. Solutions address high volume warehouse operations, order management, transportation management and cloud-based order capture and visibility systems. Cadre offers Cadence fulfillment, a unified set of applications working both on the ground and in the cloud to manage product inventory, orders, shipments and customers. LogiView, a cloud-based visibility and supply chain execution system, offers cloud-based command of the inventory, orders and shipments. Finally, Cadre offers the Accuplus software package, the most used 3rd party logistics WMS management system in the industry. “Top 100 Logistics IT Providers such as Cadre Technologies empower expansion into global markets and continue to offer innovative and practical solutions in the face of global economic uncertainty in some regions, and global economic opportunity in other regions. Cadre Technologies consistently provides the kinds of technology solutions Inbound Logistics readers need to successfully manage their global enterprises, positioning them for global growth as well as enhancing their ability to compete. As shippers, carriers, and 3PLs rely more heavily on the latest and most innovative logistics IT solutions, Cadre Technologies continues to be flexible and responsive, anticipating customers' evolving needs. Inbound Logistics is proud to honor Cadre Technologies for innovative solutions empowering logistics and supply chain excellence,” said Felecia Stratton, Editor, Inbound Logistics. Inbound Logistics is the pioneering publication of demand-driven logistics practices, also known as supply chain management. IL's educational mission is to guide businesses to efficiently manage logistics, reduce and speed inventory, and neutralize transportation cost increases by aligning supply to demand and adjusting enterprise functions to support that paradigm shift. More information about demand-driven logistics practices is available at Inbound Logistics website. Cadre Technologies is a leading provider of warehouse management software for fulfillment, logistics and manufacturing companies and is the largest software provider to the third party logistics (3PL) industry in North America. The company is headquartered in Denver, Colorado, with additional locations in Lenexa, Kansas and Baltimore, Maryland. Cadre Technologies Named Inbound Logistics Top 100 IT Provider Cadence Fulfillment Brochure - Manage Product Inventory, Orders, Shipments and Customers with Cadre.